It has been universally accepted that medicinal plants are one of the major sources of herbal drugs, which are being popular in the global market due to its comparatively cheaper price and virtually no side-effects. The use of excessive adulterants, improper processing during drug preparation, and lack of proper knowledge on its chemical constituents and its efficacies against the targeted diseases, are few common problems in identifying potential, genuine and effective drugs. Research on phytochemical screening and bioassay of potential medicinal plants are underway throughout the world, leading to discovery of new potential chemicals and noble herbal drugs. Majority of the marginalized communities and ethnic groups of Nepal are utilizing invaluable medicinal plant resources as the only source of crude herbal drugs for curing severe illness and disorders since ages. On behalf of the Ethnobotanical Society of Nepal (ESON) and myself, I'm delighted to congratulate authors of the book, Ms. Sangeeta Rajbhandary (Lecturer, Central Department of Botany, T.U., and Treasurer of ESON) and Mr. Sailesh Ranjitkar (former Taxonomy student of CDB/TU, and Office Secretary of ESON) for their significant contribution in writing this book. ESON is privileged to publish this book, which I believe, would be useful to the students of medicine especially Pharmacy, Ayurveda, and Herbal practitioners. The book will be certainly useful to the government agencies, traders, chemists, foresters, and botanists, who deals with the identification of the medicinal plants in crude and powdered form of drugs that are available in the markets. One of the most important aspects of the book is illustrative accounts of the macroscopic and microscopic characters of the commercially useful parts and powdered drugs, with notes on ethnobotanical use and pharmaceutical aspects of the medicinal plants used as herbal drugs. Special emphasis is given on the pharmacognosy of some common herbal drugs widely used in Ayurvedic medicine and herbal preparations. The book also covers important information on the history of medicinal plants and herbal medicine, laboratory techniques for the pharmacognostic study, processing of herbal drugs, commercial aspects, certification, and government regulations related to herbal drugs, etc. 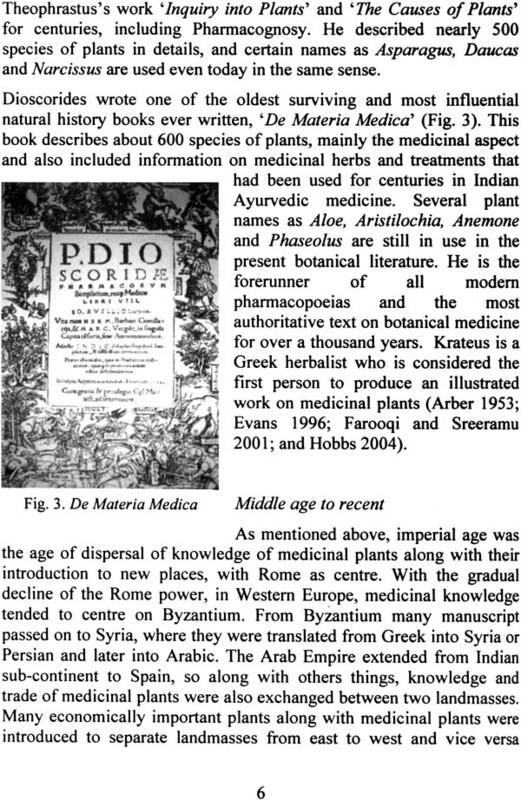 Similarly, major focus is given on the monographs of 30 commercially important medicinal plants. 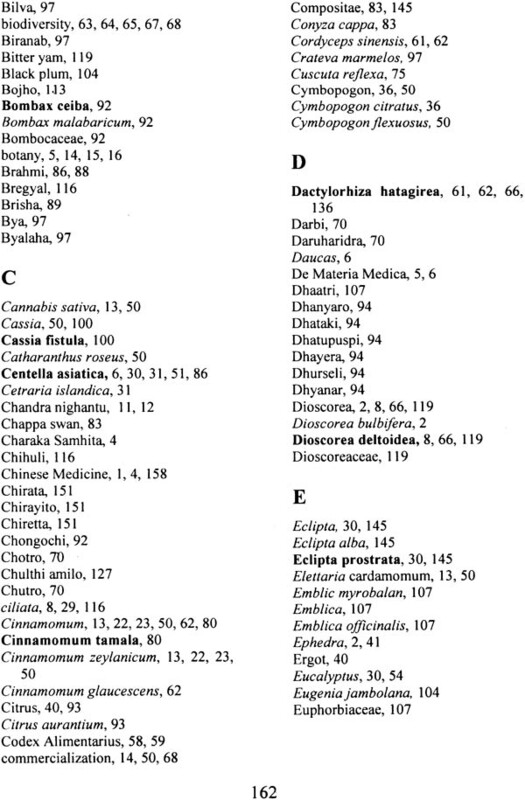 Of the 30 species of medicinal plants described here, 16 species belongs to the high priority species for conservation proposed by the Nepal Government's Herbs & NTFP Coordination Committee, 8 species of IUCN Threat categories, and three species belongs to CITES appendix list. Therefore, selection of the 30 species of medicinal plants seems to be quite justified from the conservation points of view. Several of these are threatened due to high demand in trade, unsustainable harvesting and utilization resulting in to loss of natural habitats and significant decrease in their population. Few species described in the book are already in cultivation, and few are in the process of domestication. Thus, this is the high time to encourage local communities, especially the marginalized and poor people, in the large-scale cultivation of high value medicinal plants as alternative source of income. In addition to this, people's participation should be enhanced in the processing, trade, and manufacture of herbal drugs. I'm delighted to thank the authors for their kind consent to publish the book by Ethnobotanical Society of Nepal. Special thanks are due to Mr. Ishwor Raj Rajbhandary for his invaluable financial support, without which it would not have been possible to bring out the book on time. The worldwide interest in the herbal remedy and the demand for herbal drugs has significantly increased in the recent years. These interests in herbal drugs have led to rapid increase in research of the international community in the field of medicinal plants, especially through documentation of the indigenous knowledge, ethno-medical-botany, and ethno-pharmacology. Another important aspect of the global demand in the herbal drugs is tremendous rise in the market value for the drugs and herbal products. With ever growing commercialization the number of user of herbal drugs are also increasing. According to, WHO the number of reports of patients experiencing negative health consequences caused by the use of herbal medicines has also been increasing. There are a variety of reasons for such problems like improper administration of drug, taking drug in large and undefined quantity. Beside these, one of the major causes of such adverse effect is directly related with the poor quality of herbal medicines, including adultery raw materials. 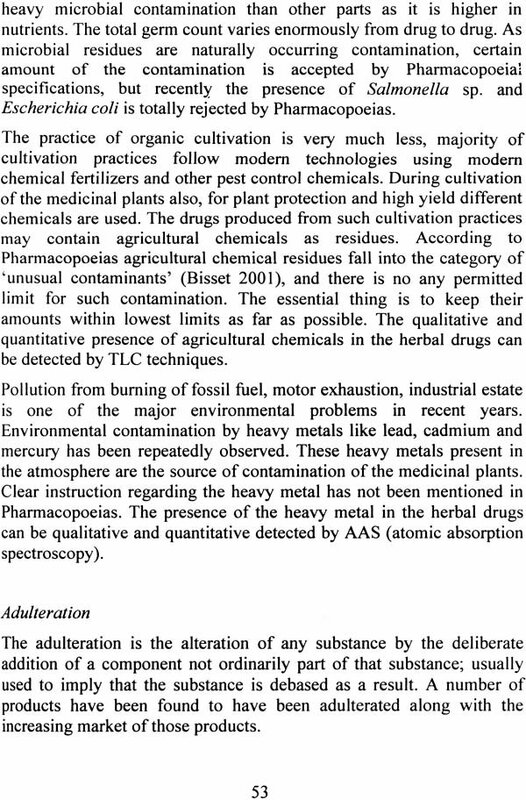 This clearly shows the insufficient attention toward the quality assurance of the herbal drugs. Quality assurance and quality control is very essential for the safety and efficacy of any kind of drug products. For safe and effective use authentication of the source of herbal drugs is very essential. In the process of authentication of the herbal drugs the taxonomic study of the source medicinal plants, detail study of the isolated plant parts and its histological features, study of powdered form of drugs and chemical test are carried out. All these techniques are studied under the Pharmacognosy. This book presents pharmacognostic tools for the authentication of the herbal drugs along with historical development of Pharmacognosy. Another attractive feature of the book is presentation of monographs on 30 commercially important and highly traded herbal drugs of Nepal. 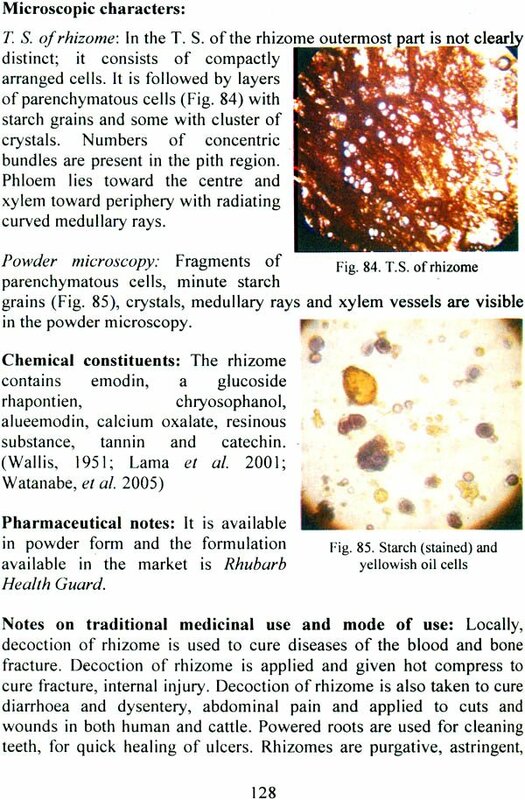 In addition, this book is intended to help the pharmacy student, as phamacognosy is one important subject in the Pharmacy course, researchers from botany and pharmacy field, interested person in medicinal plants and more importantly in the authentication of the highly traded herbal drugs from Nepal. We gratefully express our deep sense of indebtedness to Prof. Dr. Krishna K Shrestha of the Central Department of Botany and President of Ethnobotanical Society of Nepal for his Foreward and valuable suggestions. We would also like to specially thank Dr. Damodar P. Parajuli, Act. Secretary, Ministry of Forests and Soil Conservation for writing the Forward. It's our pleasure to acknowledge our sincere thanks to Ms. Ila Shrestha, and Mr. Balak Devkota for providing us some crude materials. We are also thankful to Prof. Dr. Krishna K Shrestha, Dr. Narendra N Tiwari, Dr. Olivier Aron, Dr. Suresh K. Ghimire, Ms. Ila Shrestha, Mr. Abraham L Thomas, Mr. Suresh Subedi, Mr. Rohan P. Gorkhali and Mr. Lil Jung Gurung, for being generous in allowing us to use their photographs and Mr. Mohan P. Amatya and Dr. Suresh K Ghimire for their valuable suggestion. We would also like to thank Ministry of Agriculture, Plant Quarantine section for providing us a sample of Phytosanitary Certificate. We are also extremely grateful to the Central Department of Botany for providing necessary facilities to carry out the laboratory work. Special thanks are to Ethnobotanical Society of Nepal for publishing and to Mr. Ishwor Raj Rajbhandary for the financial support. We extend our special gratitude to our respected parents for their inspiration, strong support and perpetual kind cooperation. Finally, our sincere thanks goes to all our well wishers for their folded helps and constructive criticisms. Herbal medicine, sometimes referred to as Herbalism or Botanical Medicine, is the use' of herbs for their therapeutic or medicinal value. Plants are the mainstay of medicine and credited with mystical and almost supernatural powers of healing through traditional knowledge. Traditional medical systems such as Ayurvedic, Homeopathic, Unani, Naturopathy, Tibetan and even the folklore medicines have served important role in the rural health care of Nepal. Owing to the poor economy, lack of modern health care and other infrastructure facilities, about 80-90 % people living in rural areas depend on traditional systems medicines (Manandhar 1999; Bhattarai 1999). Traditional medical practitioners are found in every rural villages of the country and occupy an important position in the Nepalese societies. Consequently, the people depend largely on faith healers and shamanistic treatments. In the past, sickness was viewed as a punishment from the gods and hence was treated with prayers and rituals that included what may have been considered 'magic potion' prepared from local herbs and administered as herbal drugs. Plants form the main ingredients of medicines in traditional systems of healing and have been the source of inspiration for several major pharmaceutical drugs. They also provided the chief remedies other than surgery and many medical theories were built around them. Therefore, plants have been one of the important sources of medicines ever since the dawn of human civilization. About 30,000 to 70,000 plants are used medicinally across the world and 80% of the world's rural people meet their needs of primary health care from such plants (Sarkar 1996; WHO 2002). Great majority of medicinal plants species are used in Folk Medicine. Traditional Medical Systems employ relatively few: 500-600 commonly in Traditional Chinese Medicine and 6000 overall (Shengji 2001); 1430 in Mongolian Medicine (Shengji 2002); 1106-3600 in Tibetan Medicine (Shengji 2001; Shengji 2002); 1250-1400 in Ayurveda (Dev 1999); 342 in Unani; and 328 in Siddha (Shiva 1996). 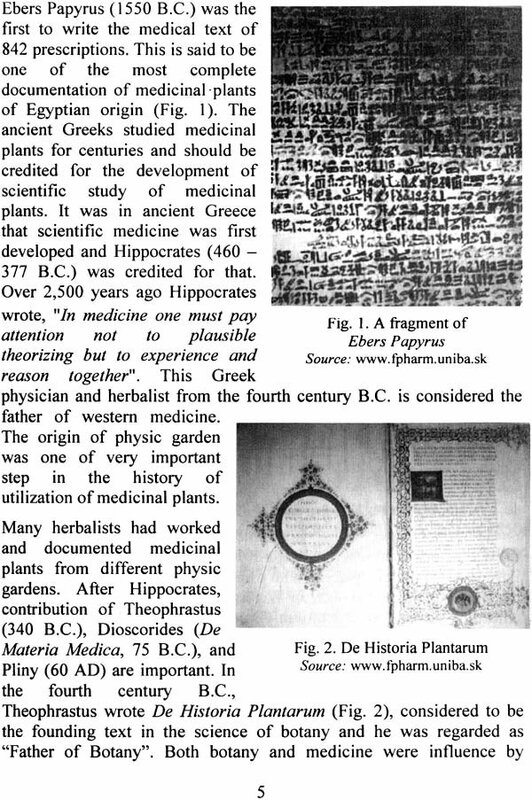 Not only in ancient civilizations, but in the present also the medicinal plants are equally important. In spite of tremendous developments in the field of allopathic medicine, during the 20th century plants still remains one of the major sources of drug in modern as well as traditional system throughout the world. Beneficial effects of plant based medicines and other plant based products are being rediscovered. Around 100 plant species have contributed significantly to modern drugs. The use of medicinal plants is increasing worldwide, related to the persistence and sometimes expansion of traditional medicine and a growing interest in herbal treatments. Approximately, one-third of all pharmaceuticals are of plant origin including fungi and bacteria. Over 60% of all pharmaceuticals are plant based (Evans 1996). 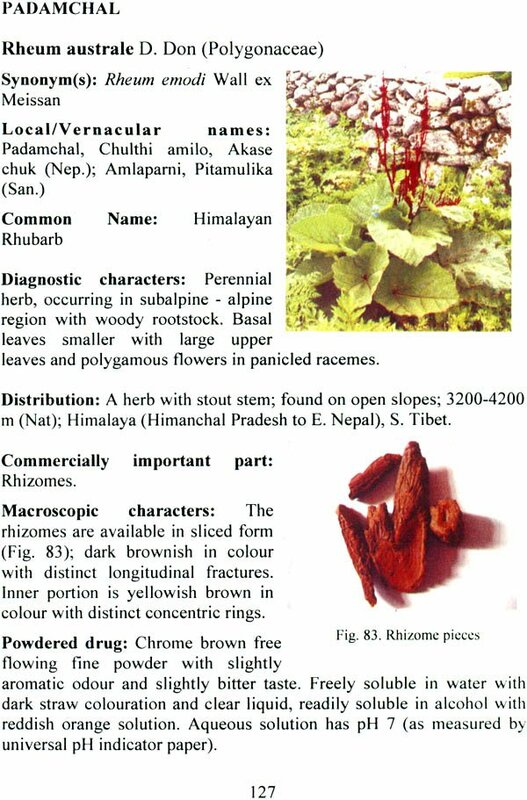 Principal chemical constituents of many Himalayan herbs have served as an important source of synthetic drugs like taxol (Taxus wallichiana), diosgenin (Dioscorea bulbifera), podophyllotoxin (Podophyllum hexandrum), ephedrine (Ephedra gerardiana), reserpine (Rauvolfia serpentina), etc (Rawal 1998). Out of nearly 220,000 species of higher plants of the world (Wilson 1988), only a small proportion has been investigated for medicinal properties and still a smaller number yield well defined drugs. South Asian region including China and adjoining regions seems to be one of the richest centres for MAPs. 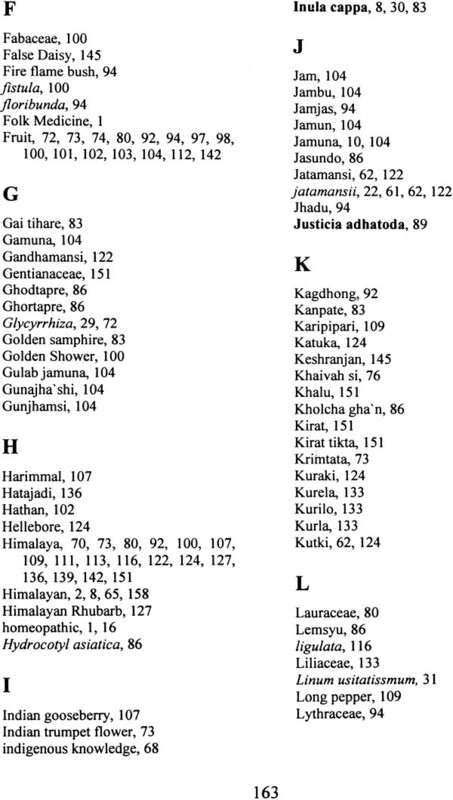 Out of ca 6,500 flowering plants of Nepal, there are over 2000 species of plants with ethno-botanical importance out of which about 1,600 species of plants have been estimated to be used in traditional medicine and a majority of which awaits proper documentation. Ethno-botanical information is leading to the discovery of novel phyto-pharmaceuticals and other phyto-products. Different ethnic group within Nepal uses about 23% of flowering plants in Nepal for their medicinal properties (Shrestha et al. 2000). Traditional medical practitioners play an important role in the health care of millions of people in the world especially in the developing countries. Most of the people do not have access to, and most cannot afford allopathic products, hence they have to rely upon the use of traditional medicines, which are mainly prepared from plants. 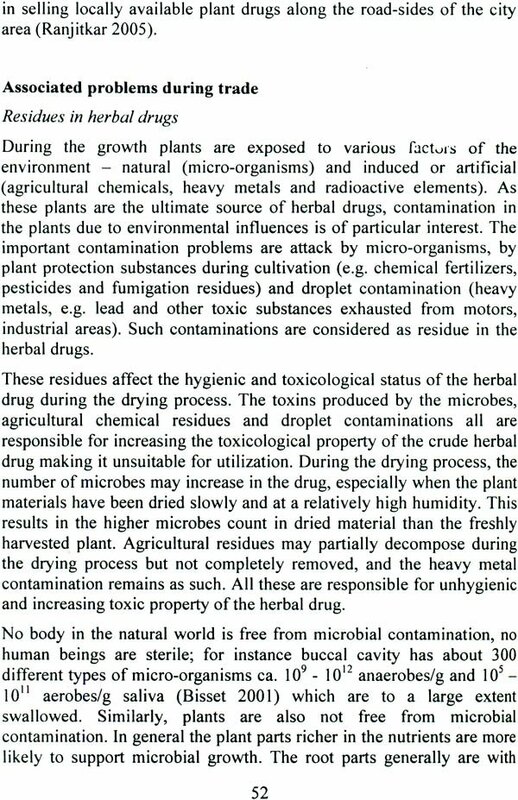 This fact is well compiled by WHO in an inventory of medicinal plants list of over 20,000 species (WCMC 1992). As a part of the strategy to reduce financial burden on developing countries, which spends 40-50% of their total health budget on drugs, WHO currently encouraged, recommended and promoted the inclusion of herbal drugs in national health care program because such drugs are easily available, easily accessible to most people in the sense of price with compare to modem allopathic drugs and considered to be much safer than the modem synthetic drugs (Evans 1996; WHO 1998).